While bathing my youngest I sat and thought about my past relationships. I thought about what had happened and why they ended. I find it so hard to come to terms with how things change so quickly. How you are inseparable to all of a sudden strangers. They become a distant memory. Before i was pregnant I had a close knit group of friends, we would do everything together. The nights out, the nights in, the little day trips, the drives and sometimes just chatting on the phone for hours on end. We planned our futures and where we would like to see ourselves; it makes me sad to think about it all again. We all made a vow that we would always see each other. We called ourselves the “Wolfpack” yes, like the Hangover. We were cool. Then I fell pregnant, they were so happy for me. They planned my baby shower and even turned up as one of our first visitors when we got home. I remember my mum telling me “you realise who your real friends are when you have children” i shrugged her off, these girls were my real friends. My rocks. We had been through a hell of a lot as a group.. how was a baby going to tear us apart? Well that baby did. Soon after having Kellan our relationships changed. I was a new sleep deprived emotional mum, one was getting married, one in a new relationship and one newly pregnant. Our lives were heading in different directions. Directions where our friendships couldn’t follow. Our lives got so hectic but we couldn’t manage one day a week to see each other. We all had our own stuff going on that you get so self absorbed in your own problems without thinking of anyone else. I realise now I could of been a better friend, I could of made more of an effort, but then so could they. 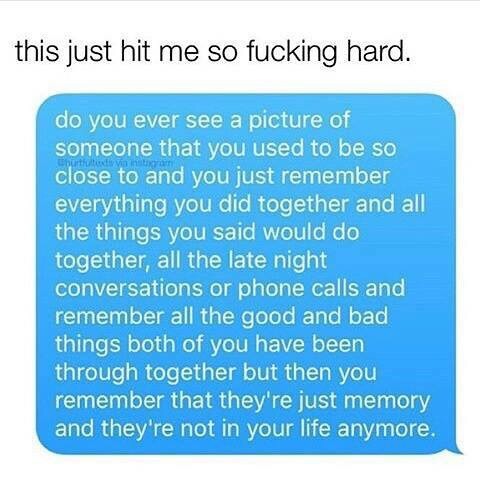 The saddest thing about all of this is my children don’t know the girls who were once my best friends. It’s true what my mum said, you don’t know your real friends until you have kids. We are all still polite if we see each other but that’s as far as our relationship goes. But one thing is for sure, we had a hell of a time when we was younger. The non stop giggles and story’s we had are unforgettable – they are the best memories. I didn’t write this post to cause a stir, I wrote it because I read something on good old Facebook and it was true. I’m sad our friendship ended this way, but our paths were obviously all meant to lead separate ways. I have no hard feelings towards anyone, and if we used to be close and we bumped into each other I would stop and talk to you. You were once a big part of my life, never forget that. I know I won’t.